So a goalkeeper scored an equaliser in the dying seconds with an outstanding back-heeled flick in the Eredivisie this week – Will Burns is here to report on the remaining five games in the Dutch top flight from week one. Danish goalkeeper Martin Hansen was the toast of The Hague this past Tuesday after scoring an injury-time winner for ADO Den Haag in their opening day clash with defending champions PSV. Now anytime a keeper sprints up the pitch for a last minute set piece, it is always an exciting time to see if the big man can rise above all others to smash a header home past his opposite number. However, this was no header – a poor free-kick from Kenji Gorre gave Hansen the option of instinctively flicking his boot up for a back-heel, which he connected perfectly with to skim the ball past Jeroen Zoet for the draw. PSV had started well and took the lead, dubiously, through their new number ten, Adam Maher. Replays of the goal showed that Maher was offside when he received the ball on 23 minutes to put PSV in front. However, minutes later the score was all level. Colombian right-back Santiago Arias bundled over Aaron Meijers which looked outside the penalty area, but referee Richard Liesveld pointed to the spot and Ronald Alberg converted. Luuk de Jong opened his account for the season just after the hour mark, simply pushing a header past Hansen after the ADO defence left the big striker unmarked until Hansen clinched a point with his dramatic leveller. A disappointing start for PSV’s looking to retain their Eredivisie title. 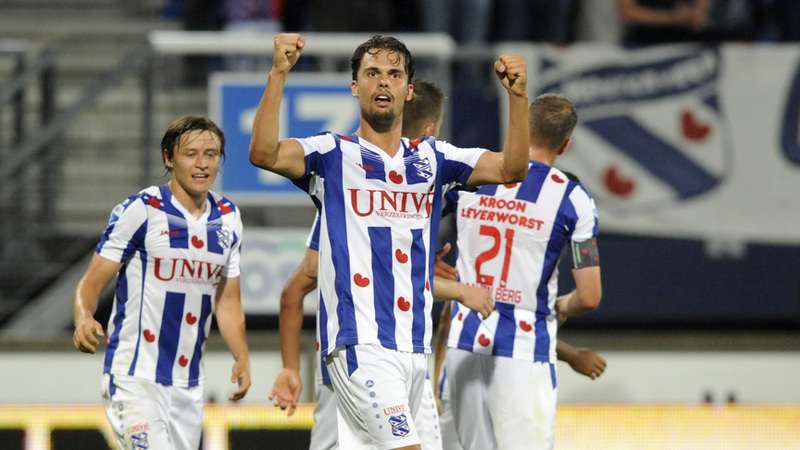 In Tuesday’s late game, Heerenveen were impressive in their 3-1 win over newly promoted De Graafschap. The Eredivisie new boys found themselves two goals down by half-time after Simon Thern took advantage of a defensive mix-up by Lion Kaak to slot past Hidde Jurjus in the De Graafschap goal. Debutant Mitchell te Vrede, a signing this week from Feyenoord, notching the second after some great work down the wing from the industrious Luciano Narsingh. It was more of the same after the break and Thern headed home on 53 minutes for his second and Heerenveen’s third. A Vincent Vermeij header was just a consolation for the visitors and they look to turn things around on Saturday as they host PEC Zwolle. Wednesday’s games began with a poor game in Groningen, as Edwin van der Looi’s side faced FC Twente which ended all square at 1-1. Twente took the lead when Renato Tapia was left alone at the front post and headed home a Hakim Ziyech corner just before the break. However, Groningen replied in the 83rd minute to salvage a point through a Michael de Leeuw goal after being played through on goal by substitute Danny Hoesen. SC Cambuur battled back from two goals down to a 2-2 draw away at PEC Zwolle. Zwolle’s new defender Dirk Marcellis grabbed the opening goal on 31 minutes after some great footwork evading the Cambuur defence by fellow new signing Lars Veldwijk (on loan from Nottingham Forest). Minutes later, the hosts doubled their lead with a tremendous left-footed long drive from Sheraldo Becker giving Leonard Nienhuis no chance in goal. The Leeuwarden-outfit fought hard and clinched a lifeline with twenty minutes to go through Erik Bakker and seven minutes later the scores were level. Sjoerd Overgoor finished beautifully after Bakker laid it on a plate for the midfielder to secure a point. In the final game of the week, N.E.C. Nijmegen left it late to defeat Excelsior. It was a uneventful and un-entertaining affair that ended with a Navarone Foor goal with just minutes remaining.